We’ve seen boards. We’ve seen contests. We haven’t seen something quite like this. With an incredibly unique idea, Four Seasons Hotels and Resorts is doing something that hasn’t been done, at least on a large scale, by any major brand on Pinterest. 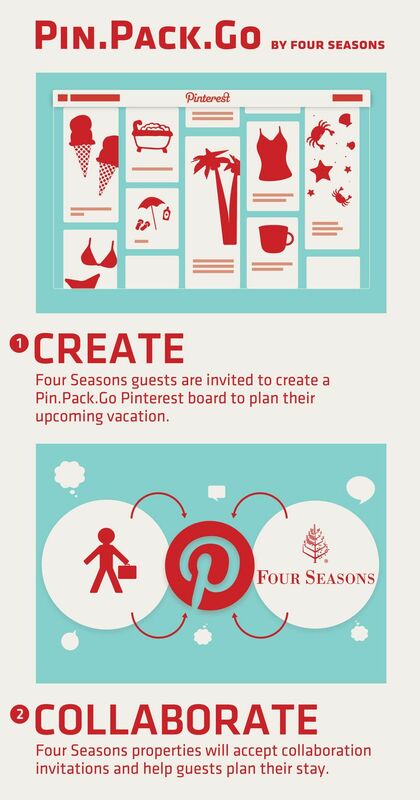 Four Seasons has begun using Pinterest as a personalized concierge service. Dubbed the “Pin.Pack.Go” service, Four Seasons Hotels and Resorts allows users to receive personal recommendations from a Four Seasons hotel. To receive the service, users create a board called “Pin.Pack.Go” on Pinterest. They then write a comment on the Four Seasons Pin.Pack.Go pin stating which Four Seasons location they plan to stay at. Four Seasons corporate then has the specific hotel follow the user on Pinterest. The user must follow the hotel back and add them as a collaborator to their “Pin.Pack.Go” board. The hotel can then begin pinning recommendations of sights to see, activities to participate in, and restaurants to enjoy near the hotel location. Pin.Pack.Go is truly a unique service offered by Four Seasons. Sound exciting? It is. The service has already received strong activity. Within three weeks, there are over 100 comments on the pin from users asking for this concierge service. The personalized Pin.Pack.Go boards that have been filled with recommendations by Four Seasons hotels, truly do provide great ideas and photographic bliss for soon-to-be visitors of the resort. Pinterest boards are filling with personalized recommendations by Four Seasons.